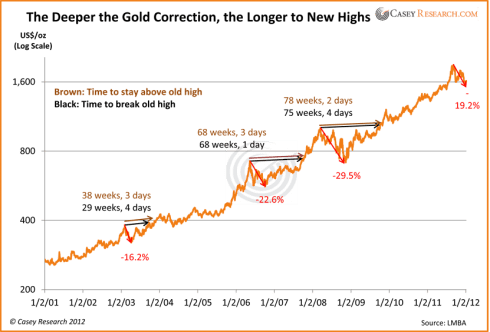 Once gold breaches its old high, you’ll probably never be able to buy it at current prices again…[Gold] will probably hit $2,000 or higher before the year’s over, never to visit the $1,600s again this cycle. If that turns out to be correct, the next four months will be the very last time you can buy at these levels. You’ll have to pay a higher price from then on. If gold doesn’t hit $1,900 until May, you’ll know this is simply normal price behavior… and when September rolls around – seasonally the strongest month of the year for gold – and the price is climbing relentlessly…you’ll already be well positioned [to take full advantage]. Regardless of the date, we’re confident that a new high in the gold price will come at some point, because many major currencies are unsound and overburdened with debt – and they’re all fiat and subject to government tinkering and mismanagement. Indeed, the ultimate high could be frighteningly higher than current levels. As such, we suggest taking advantage of prices that won’t be available indefinitely. After all, you don’t want to be left without enough of nature’s cure for man’s monetary ills. 1. Alf Field: Correction in Gold is OVER and on Way to $4,500+! Previous True Money Supply Is Already Hyperinflationary! What's Next?